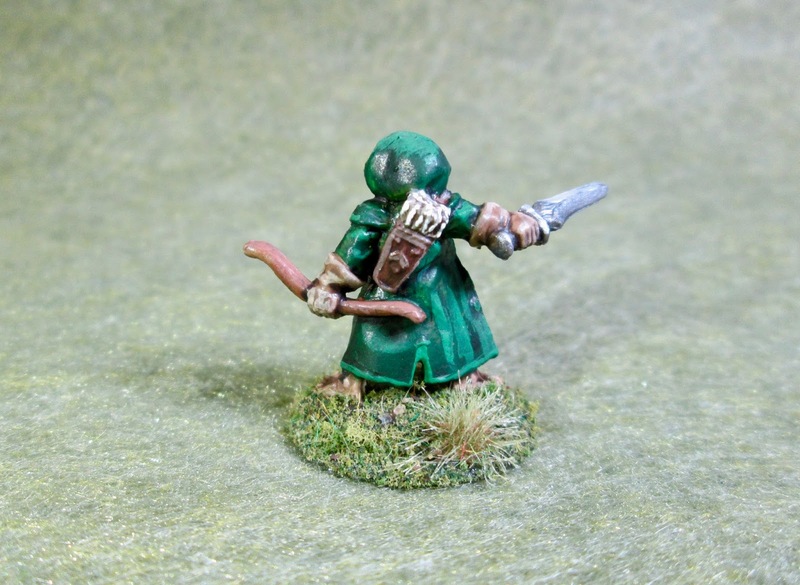 Woody Stumpwimple, Halfling Ranger: Bones 2 Figure | H.A.W.K.S. 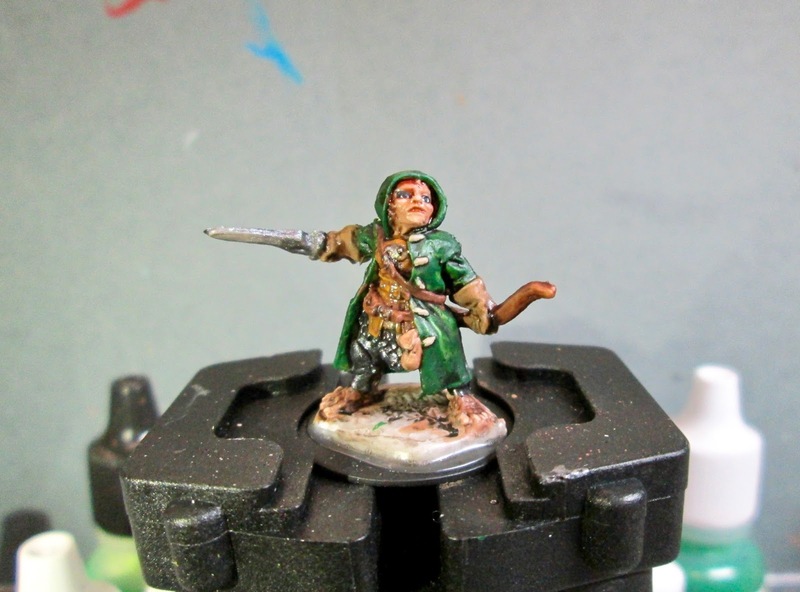 This past week I painted the Woody Stumpwimple, Halfling Ranger, figure from the Bones 2 Core Set. 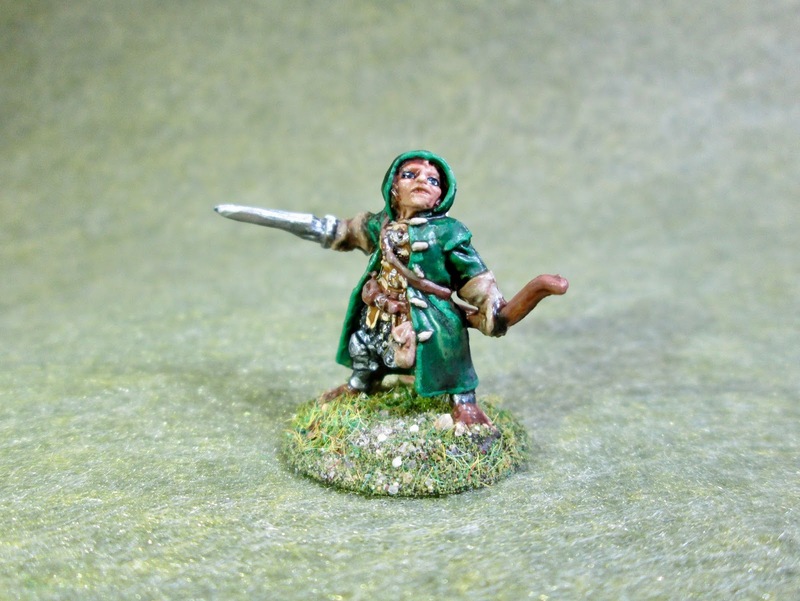 I plan to use this figure as a Scout in a Ghost Archipelago Crew I am building made up of Halflings and Gnomes. I prepped the figure in the usual way; soaking it in a dish of water with a couple drops of dish-soap added, then giving it a light scrub with a soft toothbrush, and then rinsing and drying it. 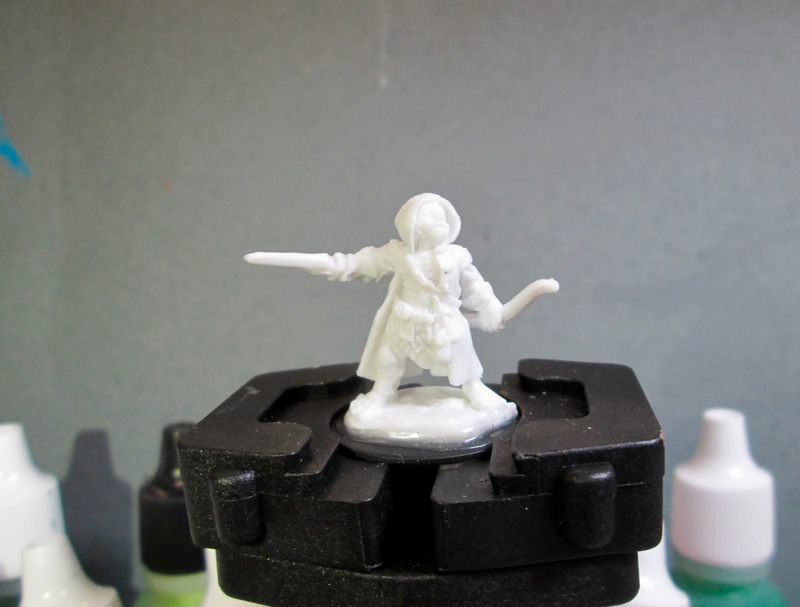 I then glued the figure to a black-primed 7/8" fender washer with Aleene’s Tacky glue. And, when the glue was dry, I put it in my Citadel painting grip. I began by giving the figure with a thinned wash of Reaper MSP “Brown Liner”. When the wash was dry, I painted the lower armor with Black, and when the Black was dry, I drybrushed it with Folk Art Metallics “Gunmetal Grey”. I then painted his face, feet, and hands with Reaper MSP “Tanned Shadow” and his torso armor with Citadel “Snakebite Leather”. Next, I painted his coat with Reaper MSP “Christmas Wreath”, and his gloves with Ceramcoat “Territorial Beige”. I then painted his belts and quiver with Americana “Sable Brown”, and his pouch with Americana “Khaki Tan”. After that, I painted his bow with Crafters Edition “Spice Brown”, and the fletchings on his arrows with Americana “Dove Grey”. I painted his hair (both head and feet) with Crafter’s Acrylic “Cinnamon Brown”, and the fasteners on his coat with Folk Art “Barn Wood”. Then, after the figure had a while to dry, I came back and I gave the body a wash with Citadel “Agrax Earthshade” wash, and the face a wash with Citadel “Reikland Fleshshade” wash. 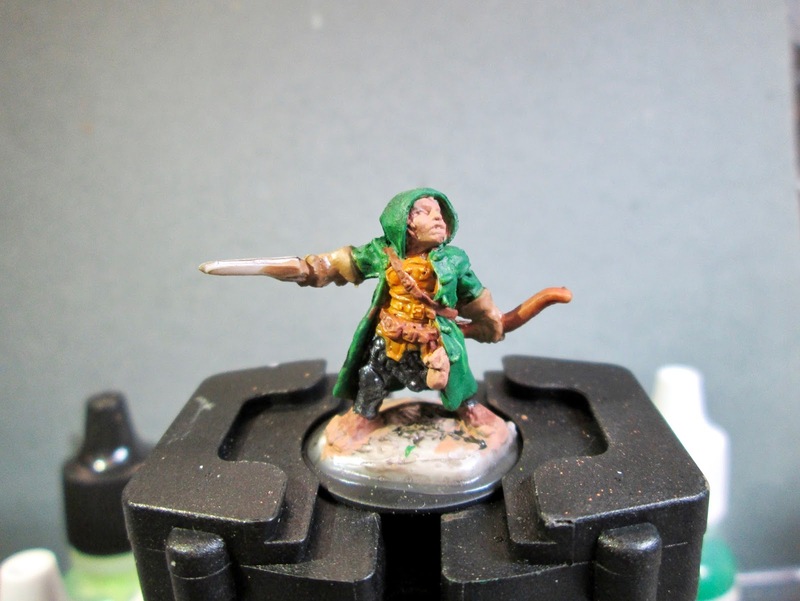 When the washes were dry, I painted his eyes, and then highlighted the face with Reaper MSP “Tanned Skin” and some Reaper MSP “Tanned Highlight”. After that, I painted his sword, first with Americana Zinc", and then with the “Gunmetal Grey”. I then worked on the highlighting his coat using Americana “Leaf Green”, and his leather armor with Ceramcoat “Maple Sugar Tan”. I highlighted the gloves with the “Khaki Tan”, and the belts and quiver with Americana “Mississippi Mud”. I highlighted the bow with Folk Art “Teddy Bear Fur”, and the Fletchings with White. The pouch I highlighted with Crafter’s Edition “Taupe”, and the coat’s fasteners I highlighted with the base “Barn Wood”. I finished up by highlighting the metal with Ceramcoat “Metallic Silver”. 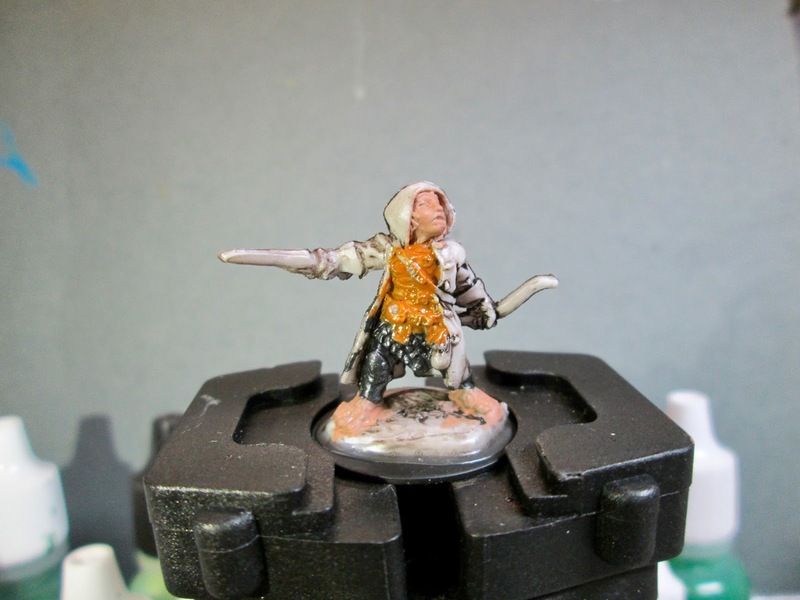 Lastly, I painted the figure’s base with Ceramcoat “Walnut”. I’m really happy with how this little guy turned out, though I don’t think his Dullcote dried dull enough. I may have to respray him.